The continued detention of Biafrans across different Prisons in Nigeria is a violation of human right and it is expedient that international human right organizations compel the Nigerian government to free all illegally detained Biafra activists. 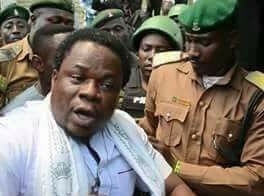 Benjamin Madubugwu and three others have been in detention at Kuje Prisons for nearly three years on allegations bothering on terrorism by the Federal Government of Nigeria which till now the counsel to the government is yet to begin the trial of the case because of the inability of finding any evidence to prove their case in court thereby leading to frequent adjournment of the case. These honourable men have been denied their right to bail and have been tortured, brutalized with no access to good medical care, their only crime was exercising their rights to self determination as enshrined in the UN Charter which Nigeria is also a signatory to it. The Biafran people have been killed, maimed, raped and maltreated in a country they are forced to belong. Hence, the call for the restoration of Biafran nation as it was before the amalgamation of 1914. A peaceful organized referendum will bring an end to this humanitarian crisis going on in West Africa. This will allow the indigenous people to chart their own course and enthrone a government they can be proud to call their own. Freedom for Biafrans will bring true African independence and ultimately bring peace to Africa. While the Nigerian security agencies have never arrested the marauding Boko Haram terrorists and Fulani herdsmen who have unleashed mayhem and atrocities against several indigenous peoples especially in the southern part of the country, it is a surprise that an administration that claimed it is fighting corruption is today employing all manner of deception to deny innocent people justice in a supposed democratic government which makes Nigeria one of the worst place to live in as humans. The security agencies have brazenly killed and murdered unarmed Biafran youths who were protesting for a peaceful restoration of the sovereignty of Biafra but cannot lift a finger on the Boko Haram terrorists. 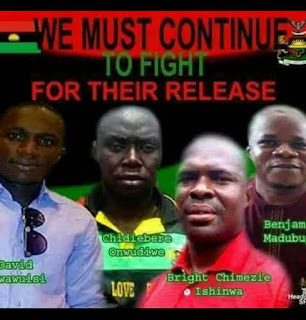 On this note, I urge the Judiciary arm of government to grant unconditional bail to Benjamin Madubugwu, David Nwawuisi, Chidiebere Onwudiwe, Bright Chimezie and all Biafra detainees across Nigeria territory and across Biafra land. International community is hereby urged to intervene on the criminal activities going on in Nigeria. There is an urgent need to sanction the security agencies in Nigeria for infringing on the human right of Biafra agitators seeking for total freedom from servitude and slavery.